Directions: From Rte 221 turn on to Old Forest Road, turn left on Link Road. Watch for signs! Parking on this main thoroughfare of Lynchburg is very limited. Carpooling or shuttling is strongly recommended. Selling a very interesting collection of fine antiques and reproductions for Dr. and Mrs. James Hengerer who are moving to their new home in Maine. 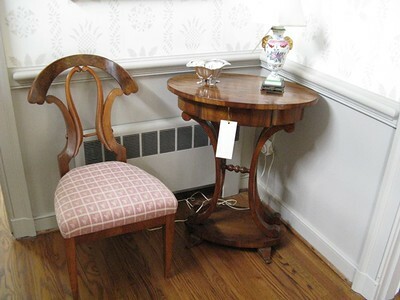 Partial listing: Furniture: A group of early 19c Biedermeier furniture with an interesting Roumanian provenance that includes a set of six early 19c Biedermeier side chairs, a Biedermeier sewing table, and a mid 19c Northern European Baroque style commode, a very nice Suter Queen size pencil post bed, a Georgian style mahogany breakfront, an 18c Virginia 3-part dining table, a large antique dough box, small drop leaf tables, primitive antique cradles, a galleried tilt top tea table, a very nice antique English double pedestal desk, mid 19c Deacon’s bench, antique dry sink, antique children’s rockers, a Sweet Briar College rocking chair, a cherry Pennsylvania House lady’s desk, an antique oak curved glass china cabinet, a fine Hepplewhite style sofa, an antique inlaid curved glass china cabinet, a pine hutch table, nicely upholstered Queen Anne sofa, an upholstered fireside bench, a 17th or early 18th century style carved English bed, an elaborately carved mirror, a nice Federal style reproduction cellarette, and much more. Silver, crystal, and china: a beautiful Tiffany & Co. sterling silver repoussed vase w/ a patent date of 1878, a complete silverplate breakfast/supper service, a silverplated melon-form breakfast server, a pair of antique 5-branch silverplated candelabra, mid- 20c sterling silver candelabra, Historic Staffordshire tureen, early 20c blue and white salt glaze, pewter and silver tea sets, a lovely and complete Shelley Wild Anemone porcelain breakfast set, large lot Fostoria Versaille Topaz stemware, Waterford Lismore old fashions, double old fashions, champagne flutes, and cordials, Waterford Kinsale water and wine goblets, Waterford Sheila sherries, Waterford Alana ship’s decanter, numerous sets and partial sets of china, a Kirk Repousse bread and butter plate, Kirk Repousse carving set, set/6 Strasbourg teaspoons, coin silver spoons, George III-Newcastle sterling silver basting/stuffing spoon, Stieff pewter tea sets, and much more. Miscellaneous: a very nice 1920s Mahal oriental rug, a Chinese deco (Nichols) oriental rug, a signed and dated 1849 blue and white Jacquard coverlet, large lot antique quilts, local paintings by Patricia Harrington, Harriet Wood, framed R. Havell framed Audubon prints—Blue Winged Yellow Warbler & Republican Cliff Swallows, a framed Sweet Briar College print, a beautiful pair of late 19c Meissen porcelain figures, wonderful cast iron antique plant stand, mid 19c oil lamps, antique wash bowl and pitcher sets, antique wrought iron bridge lamps, a Virginia Metalcrafter’s Colonial Williamsburg cast iron fire back, a 1910 cuckoo clock, antique salt glaze crocks, antique baskets, two charming Claire Murray rugs w/ original tags, antique chocolate molds, Griswold miniature cornstick pans, and much more. Numbered tickets handed out at least an hour before opening each day for admission on a first come, first served basis.